RVTS registrars work in rural, remote and Aboriginal and Torres Strait Islander health. A large portion of our work is in improving Aboriginal and Torres Strait Islander health outcomes. 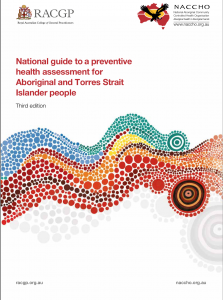 In this month’s blog, we’re focussing on preventative healthcare for Aboriginal and Torres Strait Islander people, looking at another great resource that has been developed: The National Guide to a preventive health assessment for Aboriginal and Torres Strait Islander people. Jade is a 26 year old Aboriginal female who presents for cervical screening. She is seen by the Aboriginal Health Worker prior to your consultation. The following obs have been recorded in the notes for today: BP 126/58 HR 78/min Sats 98% BSL 5.8mmol/l. What are all the considerations to bear in mind during this consult? I’ll give you a clue: there is a lot to consider! Where do you start to make sure you cover what you need to? Well – for a start, take a look at the National Guide: an excellent resource for GPs. It’s a detailed guide to preventive healthcare for Aboriginal and Torres Strait Islander patients. As GPs, we want to use every opportunity to prevent disease, especially in our high risk patients. This guide helps us do precisely that. The National Guide to a preventive health assessment for Aboriginal and Torres Strait Islander people was developed by the National Aboriginal Community Controlled Health Organisation (NACCHO) and The Royal Australian College of General Practitioners (RACGP). The guide has comprehensive recommendations for Aboriginal and Torres Strait Islander patients. It can be used in conjunction with the RACGP’s ‘red book’ and local guidelines when doing Health assessments for Aboriginal and Torres Strait Islander people. When you download the National Guide, you’ll also get risk calculation tables and lifecycle summary wall charts, with lists of recommended activities for each age group. I found the National Guide podcasts particularly helpful and interesting. We’re all time poor, and there’s a lot of reading material out there, so it’s great to have some additional audio material to take in while driving or jogging or doing whatever you do while listening to good educational material. The podcasts feature Lauren Trask, the NACCHO Implementation Officer and CQI expert, speaking to GPs and researchers about the latest Guide. Subscribe by clicking on the link under “National Guide Podcasts“. Okay, so what did I learn from reviewing the Guide? I learned that the first step in Closing the Gap is to identify Aboriginal and Torres Strait Islander patients. This needs to be a systematic process to increase the numbers of correctly identified patients. How do you do that? Simply ask all your patients if they identify as Aboriginal or Torres Strait Islander. Another thing I learned is that life expectancy was still 10 years lower for Aboriginal and Torres Strait Islander people when compared with other Australians in 2010-12, and there are still often missed opportunities for prevention of chronic disease and complications in Aboriginal and Torres Strait Islander patients. So, identifying these patients and opportunistically offering preventative health care is important. I also learned that considering the social determinants of health is important: we should consider the individual context of each patients to provide patient-centred care. In the Guide, there are specific guidelines on lifestyle recommendations, antenatal care, child health, health of young and older persons, eye health, hearing loss, oral and respiratory health, acute rheumatic fever and rheumatic heart disease, cardiovascular and chronic kidney disease prevention, sexual health, early detection of cancer, family violence and mental health…. Too many pearls to share here, so I recommend that you take a look at the guide for yourself. So what happened to Jade, our 26 year old female who presented for cervical screening with normal obs? I’d recently reviewed the Guide, so I asked Jade a few more questions. During our discussion, I discovered that Jade is currently working at the local IGA on the tills. She smokes about 10 cigarettes/day and binge drinks over the weekends. She used asthma puffers as a child, but hasn’t for several years. She’s had no immunisations since she left school at the age of 16 years. She has a sedentary lifestyle, and engages in no planned physical activity. Her parents both have diabetes, and her father is on renal dialysis 3x/week. Her brother died by suicide a year ago. Jade has had 3 sexual partners in the last 6 months, and currently lives with her partner who is physically abusive when he’s drunk. I’d suggest a good place to start is by looking at the National Guide – specific strategies are suggested, and advise on ongoing screening is discussed. Preventative health is one of the joys of general practice. We are uniquely positioned to make a significant difference in our communities by potentially preventing disease in individuals. Adequate knowledge of recommendations is one part of the challenge – meeting our patients where they are at, and exploring their individual needs, fears, difficulties, motivators and resources is another. Preventative health should never be part of a “box ticking exercise”, but be tailored to individual patient needs and goals. Registrars are encouraged to discuss all these aspects with their supervisors to ensure that patients like Jade achieve the best possible outcomes. Excellent advice and a good guide to improving one’s practice! Thank-you for putting this together.